Carl F. H. Henry has been called ""the Dean of evangelical theologians,"" and ""the premier theological representative of the evangelical movement in the last half of the twentieth century."" When his magnum opus, God, Revelation, and Authority, first appeared, it was hailed as ""the most important work of evangelical theology in modern times."" Carl Henry: Theologian for All Seasons not only introduces contemporary readers to Carl Henry the man, but also demonstrates that his theology possesses striking relevance for our own situation. We are introduced to his place in the complex mosaic of twentieth century theology, his simple but sophisticated doctrine of revelation, and his value for current discussions of a wide variety of issues. Henry's reflections on hermeneutics, philosophy, and faith; the nature of revelation and of God; the social implications of Christianity; and many other vital topics, turn out to be as pertinent now as when they were written. Not everyone agrees with Carl Henry's approach, of course, so this book features an extensive dialogue between Henry and his critics, making the case that his thought has been incorrectly described as outmoded and that he offers clear guidance for twenty-first century thinkers. To make the wealth of material on the many topics in God, Revelation, and Authority more accessible, the book includes a theological index, a macro index, and detailed outline of the entire six volumes. ""During the formative years of my theological upbringing, Carl Henry was a mentor, but more than a mentor, a friend, both to me and to Prison Fellowship . . . G. Wright Doyle offers an unfathomable gift to the evangelical world--a summary and appreciation of Carl Henry's life and work, focused on an overview of his magnum opus, God, Revelation, and Authority. Doyle's work is admiring but careful and fair, as the section dealing with Dr. Henry's critics illustrates. My prayer is that this book will bring the work of Carl Henry to the minds especially of young evangelicals, whose doctrinal moorings are being battered and stretched by leaders too agreeable, in my estimation, with the spirit of the age. Read Doyle, but don't stop there; let this clear and useful guide take you at once to the works of Carl Henry, especially God, Revelation, and Authority where readers will find their way back to the law and testimonies in cogent, relevant, concise, and always winsome terms."" --Chuck Colson, Founder Prison Fellowship and Colson Center for Christian Worldview ""Carl F. H. Henry was a big man who wrote large books about the greatest subject of all, the incomparable God--Father, Son, and Holy Spirit--whose revelation of himself in Holy Scripture is the authoritative norm for all our thoughts and beliefs about him. Henry's stature as an evangelical theologian grows larger every year amid the small ideas and minor absolutes of our time. 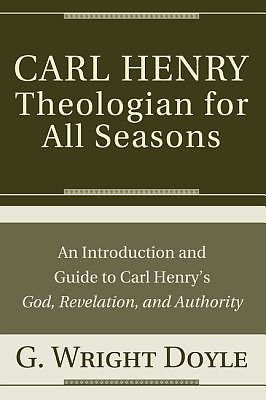 This book honors Carl Henry by helping us to heed what he said--and still says--to the church today."" --Timothy George Founding Dean, Beeson Divinity School Senior Editor, Christianity Today G. Wright Doyle is Director of Global China Center and English editor of the Biographical Dictionary of Chinese Christianity (www.bdcconline.net). He is author of Christianity in America: Triumph and Tragedy (2013); Reaching Chinese Worldwide (2013); Christ the King: Meditations on Matthew (2011); Carl Henry: Theologian for All Seasons (2010); and co-author of China: Ancient Culture, Modern Society (2009).